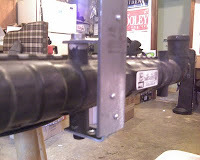 This past Sunday, after giving the garage a quick-cleaning, I started working on the brackets for the radiator. I've spent some time researching hoses, so I'll put some of that output up here. Last, Hal is starting up his own 'water-cooled engine into a bus' project. I'll hit some of the high notes on that plan. I looked at the Jetta radiator that I plan to use, and decided that the best plan of attack was to use the rubber-ish holes that originally held the fan shroud in place. On this particular radiator, the shroud mounting holes are on both sides of the radiator, so I was able to fabricate "C" shaped brackets using angle braces from Ace Hardware and some flat-bar stock I have lying around. I rolled under the bus at a point when the pouring rain slowed to a sprinkle, and took a quick survey. I should be able to attach the rear end of the radiator to the cross beam just in front of the transaxle. 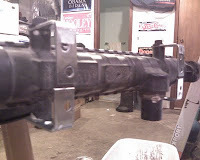 So, I riveted some 1/8" rivets through the angle braces and into 1/8" holed drilled into the flat-bar. I made sure I cut the flat-bar long enough to rise above the radiator and the water inlet/outlet. I haven't decided how the coolant will integrate, but I don't want my cutting the bar too short to factor into it. I should be able to bore a hole in the bar and in the beam for a thick bolt. Then, I moved to the front-end of the radiator. The front end will be facing the on-coming air, so the brackets need to be a little different. 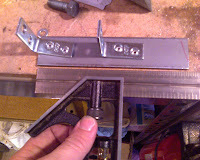 I cut the flat-bar much shorter (3-1/2" long) and flipped the top angle brace to reduce the air interference. I had to cut a bit off the angle brace to make it fit, but the result was a small "c" shape before riveting the flat-bar. My plan is to weld / rivet some square-bar across the top of the front end of the radiator and then tie in uprights at the sides. This should provide a strong attachment point for a deflector as well as maximize the available air-flow. I should also note that the square-bar should help protect the temperature sensor from debris. The placement of this sensor definitely influenced this design. I still have another front bracket to fabricate and I have to think through how the front end of the radiator will physically attach to the bus. Hopefully, I'll get a break in the rain when I get to that point. I've spent a great deal of time trying to find a reasonably priced solution for getting the coolant from the engine to the radiator and back again. Between Goodyear, Ryder Trucks, and McMaster-Carr, I couldn't find a good source. Hal found this hose at Gates, and I think we may have a winner, if I can figure out a way of buying it retail for a reasonable price. Once we get th e radiator in place, we'll know how much we need, and then I'll start peppering them with emails for product. Speaking of Hal, he's starting up his own water leaking engine into a bus project. He acquired a 1.8L gas-burner for nearly scrap-metal prices. He's still going through the engine looking for badness, but he's been able to replace most of the issues very easily. He chose a 2000 Astro Van radiator, and that may become a problem with the inlet/outlet sizing, but otherwise, I think he will have a smoother path than we've had with Hapy. Hal's new adventure hasn't dimmed his interest nor progress with Hapy, though. He stopped by on Sunday to pick up some tools for his bus, and to grab the dog bone. He'll be working on the dog bone mount at his place where he has fancy shop tools. Hopefully, we'll have some remarkable progress in the coming weeks on that end. So, this next week is pretty busy. I do hope to have that last front bracket finished, and the square-bar integrated so I can start thinking about how the front will be supported. I'm not sure if I'll actually have any time with the bus this weekend, but I'll certainly try. bottom - starting the front brackets. You can see the cut-down of the angle braces. That's the temperature sensor pointing down.